I’ll admit it. I’m a sucker for New Orleans pralines. Whenever I visit the Crescent City to board a cruise ship, I always find time to buy some pralines. On my last trip, however, I also learned how to make the tasty treat. That could be dangerous because I usually have all the ingredients to make a batch at home and I’m sure I would eat them all. A Creole favorite, pralines were originally used as a digestive aid, said Michael W. DeVidts, an instructor at the New Orleans School of Cooking. Since 1980, the school has introduced countless visitors from around the world to the wonderful food and rich culture of Louisiana and New Orleans. Classes are held in the school’s beautifully renovated 1830s molasses warehouse at 524 St. Louis Street, between Chartres and Decatur in the French Quarter. Or classes can be brought to sites, such as a cruise ship. When French colonists settled Louisiana, native pecans were substituted for almonds. No lengths were spared by the Creoles to achieve perfection in candy making, Michael said. Combine all ingredients and bring to a “soft ball stage” – 238-240 degrees, stirring constantly. Remove from heat. Stir constantly until mixture thickens, becomes creamy and cloudy and pecans stay suspended in mixture. Spoon out on buttered waxed paper, aluminum foil or parchment paper. When using waxed paper, be sure to buffer with newspaper underneath, as hot wax will transfer to whatever is beneath. 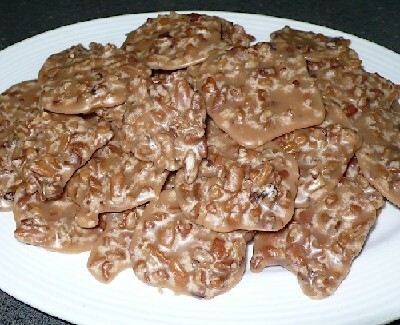 Makes about 50 pralines, depending on size. Many cruise ships depart from New Orleans. Contact a Crown Cruise Vacations agent today to learn more by calling 877-283-1114.